Well it has been a long time since I posted but, I have been busy! However not with tatting. 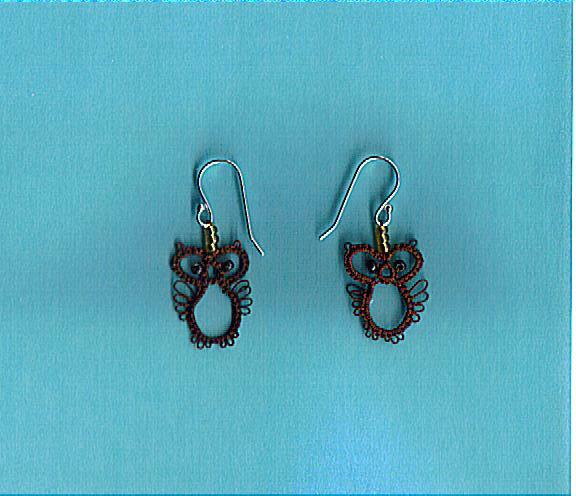 The only thing I have to show for my tatting is my little owl earrings that are my very first, very own pattern!!! I think they came out cute and the pattern is on intatters if you would like it. These came about because a friend at my church asked me to tat a pair of owl earrings for her daughter in law who collects owls, I tried several patterns and nothing seemed to be small enough for earrings! I finally sat down and doodled these. Hope everyone has a great weekend! I have added the pattern in my comments it is the 3rd comment. I hope you enjoy it! Those are so awesome!!!! Owls aren't my thing, but if I wore earrings, I would wear those! What a cute set of owls could you please send the link as I cant find the pattern! Thank you so much I shall be trying them out and will post on my blog when done. Those are SO cute. So VERY cute. I love patterns that really, really look like what they're meant to be and these certainly do that. These are precious! Don't you love the way tatting works,simple rings and chains, a suggestion of a shape and it all comes alive. These are adorable. Thanks so much for sharing your pattern with us! Can the owl pattern be done using a needle instead of a shuttle? Is it written out any where that way. I absolutely love them and would like to make one for an "owl miss you" greeting card. Thanks!! !